It happens several times when we are watching some videos on YouTube and the background music of the videos appeal us the most. We go online and start searching for that unknown but heart touching song. Unfortunately, the song is not available online. But it doesn’t mean that you cannot add that song to your playlist. The great news is that there are so many advanced audio recording software tools that allow users to record audios directly from YouTube videos. Go to the internet and open Online Video Converter tool. Paste your video URL in the text field available at the top of the website page. Choose your output file format as mp3. Hit the Start conversion button. When the conversion is done, you will get a download button on the screen. Hit this button and soon your file will be saved to your device. While, if you find the ads on the website is annoying and need a better solution, then keep reading. First, download Audacity program on your system. Note that it is available for free, so anyone can get it easily from internet. Run the setup to begin the installation process and follow on-screen guidelines to finish the process. Open Audacity software on your system and from top menu bar hit Edit option and then go to Preferences. In the Device section of Preferences window, switch to the Recording section. Choose Stereo Mix option. In case if it is disabled by default, you may need to enable it first. To do this, go to the control panel of your computer, go to Hardware and Sound section and then switch to Sound section. Now go to Recording tab and right click with the mouse on the blank space of the screen. From the drop-down menu choose Show Disabled Devices option. You will find Stereo Mix Device option on the screen; right click on this device and hit Enable option. Hit Ok to save the new sound settings. After these settings, you will have to open the Audacity program again to work with Stereo Mix option. It is time to open your YouTube video and hit the record button. Make sure the connection is fast enough to play video without any interruption, otherwise keep it loaded in advance. Play the video and when done, hit the stop button on Audacity program. This file can be exported and saved to a device with the MP3 file format. The third choice for recording YouTube audios is using Streaming Audio Recorder. 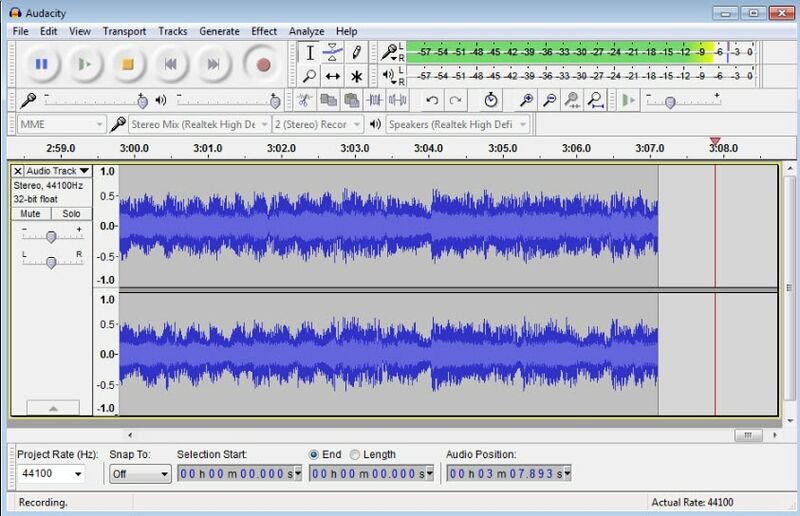 The great news is that this software cannot only record audios for you rather at the same time it is loaded with advanced editor tool that allows easy cutting and splicing of sounds for the creation of customized videos. With Streaming Audio Recorder, you can also convert your videos into various file formats. Go to the internet and download Streaming Audio Recorder. Install and open the program. Hit gear icon on the main interface and then move to settings. Set source of the audio input as System Sound. Start playing your desired YouTube video and on recorder, hit the record button instantly. As soon as the recording task is complete, hit the Stop button and your recorded audio will be soon saved to the targeted folder. You can also use Filmora scrn to record your YouTube audio and then save the recorded audio or the video to MP3 format at exporting and then you can listen to the recorded audio and music even when there is no network connection. With these advanced tools, the audio recording task becomes quite simple and easy. Even beginners can handle with without any trouble. If you are interested to capture your favorite tracks from online videos, it is right time to choose any of the above suitable methods and start recording your audio. The recorded media files can be further customized as well as shared on other social media platforms. It is a great idea for today’s creative young generation. These handy tools can make your audio recording task quite easier and resultant files can be saved in a variety of file formats for further sharing.